EAI Benefits | How EAI Helps Improve Business Processes? Enterprise application integration is an essential component of the digital transformation strategy for businesses today. It offers efficient data flow from one system to another. With a set of technologies, tools, and structures, it ensures real-time integration between different applications. However, the report suggests that the business prospect for IT vendors providing enterprise application software are higher as more than 90% of US-based companies use business applications. EAI brings together existing business applications for better information sharing & synchronization. 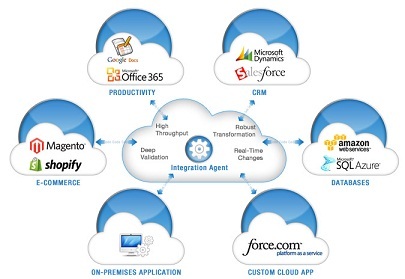 So, what are those actual benefits of enterprise application integration for different companies? Read on as we try to demystify the fascinating benefits of EAI for businesses. Through this article, our objective is to delve deeper into understanding this concept and its approach. Why Enterprise Application Integration (EAI)? Information systems and their architecture evolve with the introduction of new technologies. EAI helps to integrate the latest applications to bring down the costs and achieve real-time benefits. It enforces better techniques to combine functionality and different application information into a single package. It enables users to access their data and for organizations to serve data easily to their potential customers. However, the industries base their activities on different systems and applications. They help stimulate growth and improve the company’s performance. ERP, CRM, WMS or eCommerce solutions store relevant information and transactional data of business operations. The said independent systems and applications achieve what is required of them for a specific purpose. The only downside is that they work in isolation, causing congestion in the performance of business processes and problems that can add additional financial risk to the organization. Enterprise application integration addresses this problem and offers several other benefits that are listed in this blog. Information Sharing: With EAI, you can consolidate all the data across individual systems to create a single access point. It not only saves time in searching for information from various methods but it also allows users from different departments to access updated data. Another advantage of EAI is that it helps improve collaboration between individuals from multiple departments. Learn how synchronization of legacy ERP systems with Salesforce.com helped one of the leading healthcare products providers enhance their productivity and collaboration across the teams. Centralized Flows: Earlier the companies had to develop application-specific interfaces and connect them point-to-point as required. The result was a complex network, challenging to maintain and evolve. With EAI, all interfaces converge to a central server (hub) that processes and redistributes flows to registered applications. Process Automation: The EAI platform helps improve the automation of business processes and provide timely and accurate information to users and customers. Further, it bridges the gap between two different systems so that data can flow smoothly between applications. It eventually improves business processes as well as enhances the transparency of financial workflows. Increased Efficiency: By streamlining the business processes, enterprise application integration benefits the organization’s overall efficiency. It helps to make communication easier, reduces their time and effort with better functionality, and improved control. Further, it could even help companies to address the change in market trends, managing their reputation, and issues related to disruptions in the supply chain and more. For instance, if you are in the retail industry, you may particularly benefit from integrating your sales channels, eCommerce and ERP platforms to drive revenue and encourage consumers to interact with their favorite retail brands. Read more here on how integrating eCommerce portal with ERP helped improve retail management. Reduced Time: EAI helps in significant reduction in the time needed to integrate new data or redesign processes. It makes the information system responsive to the company’s operational or strategic requirements. Moreover, it establishes a link between two or more platforms. Thus, the data from one platform are accessed by the other platforms meant to be integrated. Complete Control: One of the key advantages of implementing EAI is that it allows controlling the information flow. It provides universal access and sharing of all data and components of the information system, whether standardized or asynchronous. The different mechanisms in EAI will give full knowledge of the integration that facilitates complete control of the company. Minimize Errors: EAI provides consistent master data for all applications used. It leads to a significant reduction of errors that may occur due to incorrect information accessed by different users. Further, it helps in the immediate elimination of repetitive tasks, errors, and possible bottlenecks in business processes. Increased Agility: Real-time data, updates, delivered according to established business rules, significantly improve the efficiency and speed of decision-making processes in management. It helps businesses to respond to new opportunities and make the most out of them. The integration and customization of applications are critical to an organization’s growth plan. They can add new customers to our system without having to mobilize administrative resources. Enterprise application integration solutions help to enhance the performance of organizations, which is in-line with their business goals. As an offshore enterprise application development company, Rishabh Software can help you modernize your applications. Our teams combine best practices to support synchronizing of multiple platforms, providing a central access point to your data.